A lot of misdirection goes into keeping voters from noticing recurrent patterns. No Republican wants to hear awkward questions like “Why did the economy collapse during alcohol prohibition in 1907 and 1929?” It took the GOP twenty years to erase connection between Prohibition and The Crash and again put religious zealots in the saddle–with Richard Nixon as Vice-President. “Under God” was added to the Bellamy Pledge of Allegiance and graven images were added to our currency. Surely similar events had nothing to do with the asset-forfeiture Crash the George Bush Jr. Administration oversaw in 2007–that by 2008 had completely collapsed the United States economy. Or could they? The one word you never see in connection with the Panic of 1907, Crash of 1929 or Depressions of 1932, 1988, or 2007-12 is PROHIBITION. During TR and Taft’s Republican “noughts,” only Mr Dooley had the courage to mention the spiking of whiskey with cheap morphine in the South. There was a morphine glut because the Chinese were again (as in 1837, 1840, 1856, 1900 and 1907) upset enough to forcibly exclude the dumping of genuinely addictive narcotics over there. Such dumping was indeed permitted by a punitive treaty the US had ratified after the Boxer Rebellion. The dumping of opiates in the Philippine Islands and Hawaii at about this time led to a frightening surge in addiction. Pretty soon, Americans enforcing sudden “cold turkey” prohibition in the Philippine Islands (while also banning the relatively less harmful alternative, beer) were picked off by snipers and hacked to bits in insurgent raids. The US economy felt a depression in 1903-04 as another haughty treaty (defining Christians as good) heaped humiliation upon the Celestial Empire. Domestically, the excesses of crony mercantilism clashed with fanatical prohibitionism, this time under Republican Theodore Roosevelt. It was Teddy who, as Police Commissioner, had closed down so many saloons in New York City. Beer was banned from all US military canteens and Post Exchanges. The 47th Annual Brewers’ Convention in 1907 reported that “Legislation of an unfavorable character has been undertaken in the legislatures of many states.” Ice was what made beer cold. Then as now “ice house” was usually a name for places cold beer was served. Dry Christianity, fresh from legislating Chinese Exclusion laws and labeling of narcotics as such, now declared Total War on The Ice Trust, including Knickerbocker, and Gambrinus’ Kingdom of Beer. This struggle, assisted by Attorney-General Bonaparte, stretched and tore at the fabric of the US economy in the year 1907. 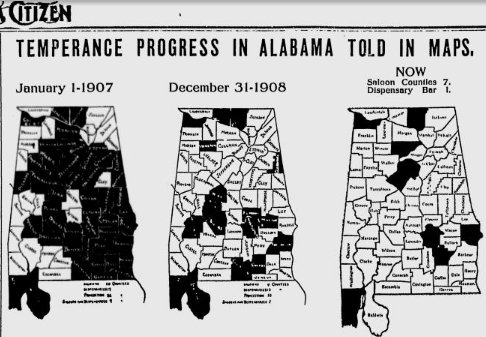 The Panic of 1907 was driven mainly by unintended consequences of prohibitionism, mostly in the Deep South. Alabama, for instance, made beer and the Demon Rum hideous crimes, with most of the state bone-dry in early 1907. A year later, after the economic collapse, the picture was completely reversed, yet no one admitted that prohibition had caused the Crash and Panic or that repeal was the logical response. When the stock market began its collapse in March of 1907, the President loudly denied government action had been the cause. Likewise both George Bush asset-forfeiture Crusades–especially once the government had been packed with “faith-based” organizations and activists for Bush Jr’s second term–ended in economic disaster. 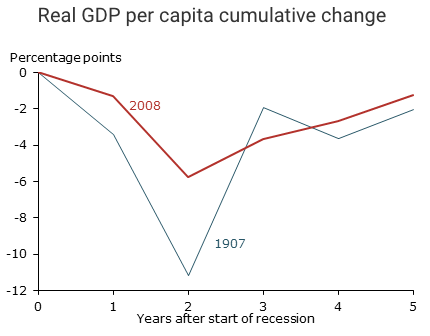 Sure enough, there were recessions in 1988, 1992 and 2007. Here is George Bush acting like the government had nothing to do with the debacle. Sure enough, not a word is said about the Financial Action Task Force (FATF) his Administration unleashed. But New Mexico, Vermont, Michigan, New Jersey, Arizona, Massachussetts, Washington, Maryland, Alaska and Oregon all legalized marijuana within seven years of George Bush’s asset-forfeiture crash. States had reacted to collapse in much the same way after President Hoover’s use of asset forfeiture to enforce laws that made light beer a felony. The Flash Crash of May 6, 2010 coincided with DEA seizures of bank accounts belonging to Colombian nationals, and the Flash Crash of March 18, 2015 coincided down to the minute with international reaction to the release of the Bureau for International Narcotics and Law Enforcement Affairs International Narcotics Control Strategy Report, Volume II, Money Laundering and Financial Crimes on that date. The progress made over the last three decades against drug abuse is eroding, whether for cultural reasons or for lack of national leadership. In many jurisdictions, marijuana is virtually legalized despite its illegality under federal law. Therefore, we favor the repeal of all laws creating “crimes” without victims, such as the use of drugs for medicinal or recreational purposes. Spare a thought for these myriad shocks to the US (and world) economies. Consider the safety and financial future of the younger generation as you prepare to vote.